Heating conditions in home environment can have significant impact on older adults. Serious health problems and lack of comfort can originate when home environments are not properly heated. This can have serious implications on older adult’s health and wellbeing. In addition, it can have significant impact on informal carers who cannot afford leaving elderly people alone in their home. The aim of the SmartHeat project is to radically change the home heating experience for health, comfort and wellbeing of elderly people. The goal will be achieved via the development of a smart, secure and elderly friendly ICT system for home heating monitoring and control. The system consists of hardware and software components which monitor and control the temperature in every room independently. The platform will also be equipped with intelligent algorithms, which learn the user habits and control the system in an automatic and transparent way, with a Web and smartphone application in order for the users (including relatives) to remotely interact with the system from home as well as via the Internet when being outside the home and with wearable computing devices (e.g. a bracelet or smartwatch) which help optimize the system based on biometric and other environmental parameters. The project results are expected to improve comfort at home and at the same time to reduce the energy expenses. These are considered to be major benefits which have positive impact on the quality of life of older citizens and which, at the same time, promote self-management and enhance autonomy. In addition, the SmartHeat platform will be equipped with a remote management and alert system which facilitates the role of formal and informal carers in monitoring and controlling the temperature conditions of older adults at home. The Smart Factory concept has been enabled in the last few years thanks to the utilization of both Wireless Sensor Networks (WSNs) and Radio-Frequency Identification (RFID) technologies. Although the two technologies have been adopted in isolation in the specific case of the factory automation, their partial integration starts to be considered in different research fields. In this work we propose a fully integrated approach between WSN and RFID technologies targeted to develop an advanced safety system in industrial plants. By integrating RFID tags and readers on WSN nodes, the developed system on one hand extends the sensing capabilities, the efficiency and the pervasiveness of WSN solutions already installed in the factory plant, on the other hand guarantees a safety access to dangerous areas under the requirement that safety equipment is adopted. Performance evaluation in terms of system response time shows as a correct access or deny can be notified to the worker in less than 192 ms, showing the system applicability to safety enforcement processes in factory environment. The continuous miniaturization of devices and the ceaseless reduction of their costs are fostering the development of intelligent houses, cities and factories. Academic and industrial research communities are making use of these novel components for enhancing the security, safety, efficiency and convenience of a large number of human-related environments. In particular, in the past few years, a large number of research activities have proposed solutions for making possible the realization of the so called ”Smart Factories”. Ideally, a Smart Factory aims at assisting people and machines in executing their tasks in a context-aware manner. Although the implementation of a Smart Factory can be enabled through various technologies, the solutions providing the best trade-off between costs and performance are based on Wireless Sensor Networks (WSNs), Radio-Frequency Identification (RFID), or combinations of them. 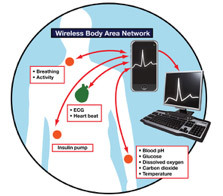 Wireless sensor networks are composed by low-power embedded devices characterized by reduced computational capabilities that communicate among them to fulfill complex tasks. WSN technology is used in a Smart Factory context to perform real time environmental monitoring, industrial asset tracking applications, and localization of both people and equipment. Radio-frequency identification, similarly to WSN, is an extremely low-cost and low-power technology implemented in several possible manners, each one of them characterized by different transmission bandwidth and communication ranges. Concerning the Smart Factory context, RFID is mainly adopted for simple object identification or, in case of advanced applications, for estimating goods positions and speed. This work proposes an integrated WSNs and RFIDs based solution aiming at implementing an advanced safety system in industrial plants. The system mainly implements a two-level access control policy that can be used for monitoring the access to dangerous areas of industrial plants. The first control level guarantees that the access to a given area is provided only to workers authorized to enter in that plant area (e.g., only electricians can enter in power control rooms). This system feature is implemented by means of a smart node, a WSN node integrating a semi-passive RFID tag. The tag contains a unique identifier that can be used in conjunction with a workers database for retrieving worker’s identity. Leveraging the semi-passive nature of the tag, advanced energy-aware policies can be implemented allowing a significant extension of the node lifetime. The second control level is enforced by using passive RFID tags installed on workers’ equipments, thus guaranteeing the access in safety conditions. Both controls are performed by using a RFID reader integrated with a WSN device, a WSNREADER, that is installed in the access point of an Area Under Control (AUC). Moreover, the system adopts the radio frequency signal sent by the RFID reader for waking up the WSN subsystem of the smart node. In this way when smart nodes are outside the AUC area a negligible amount of energy is dissipated. The possibility of waking up the smart nodes at the entrance of the AUC area from one hand extends the node lifetime, while to the other hand can be used to location-aware services (e.g., worker localization and vital parameters monitoring in restricted areas). The described system functionalities when entering in the AUC are depicted in Figure 1. Starting from the above introduced high-level description of the system its hardware and software building blocks are described in the following of this Section in respect of their capabilities and design strategies. The core hardware component of the full system is the smart node, which in our design is a custom WSN node in which a semi-passive RFID tag has been integrated. 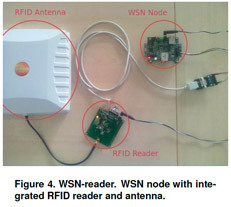 Other key component of the system is the WSNreader, an RFID reader interconnected with the SEED-EYE board, depicted in Figure 4. The adopted reader is the module Sensor ID Discovery UHF OEM which has been connected with the WSN device by means of a simple serial interface while developing a set of software functions able to abstract the device as a common interface. The reader is able to support the EPC standard for reading data from tags memories and is able to reach a transmission power of 500 mW (27 dBm). The final distance in reading tags memories is close to 5 m with an omni-directional antenna. Regarding the passive tags to be used on safety equipment we selected the ALN-9654 G model, produced by Alien, due to its extreme low-cost and compliance with the EPC standard. Programme: Operation Programme ERDF Molise 2007/2013 -Asse I - Attività I.2.1 Programma di ricerca industriale, sviluppo sperimentale e industrializzazione dei risultati - R&S - PMI. Overview: Telemedicine is the use of telecommunication and information technology to provide clinical health care from a distance. It helps eliminate distance barriers and can improve access to medical services that would often not be consistently available in distant rural communities. It is also used to save lives in critical care and emergency situations. These technologies permit communications between patient and medical staff with both convenience and fidelity, as well as the transmission of medical, imaging and health informatics data from one site to another. 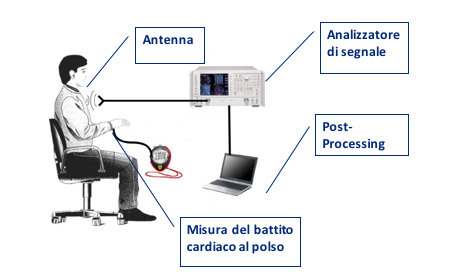 The aim of the Bi.r.Se project is to identify a non-invasive Radiofrequency measurement approach for non-contact measuring of both heartbeat and breathing rate, which makes use of a single wearable antenna close to the body surface. A prototype and a preliminary measurement campaign has been carried out in order to validate the methodology. Measurements were taken at different frequencies in the UHF band with different kind of antennas, during regular breathing activity. WP6 - Product Prototype: Designing and mounting of PCB with a shaping fit for a standard enclosure used inside the company for other applications; Test performed with a pre-series on company employee.